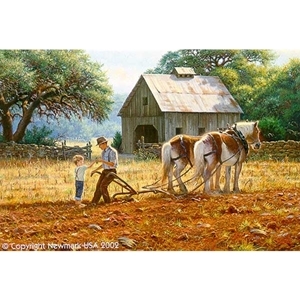 Here, Daddy ~ Recognizing how hard his Father is working the fields to provide food for the family and community, the little boy wants to do his part and bring Daddy a drink of cool water. The horses wait patiently for the command to pull the plow through the rocky soil. In a world of turbulence and unrest, I wanted to gently remind us of the beauty and peace available in this life.